I recently had the privilege of making some burlap curtains for a friend. Allisa from Thobe Rentals asked me to make her some window treatments – 2 of the places a couple simple, hemmed panels would suffice. But for the door we decided something a bit more sophisticated was called for. I suggested a Burlap Roman Shade. After discussing it and checking with her husband about his opinion of making a Roman shade work there we decided to go for it. 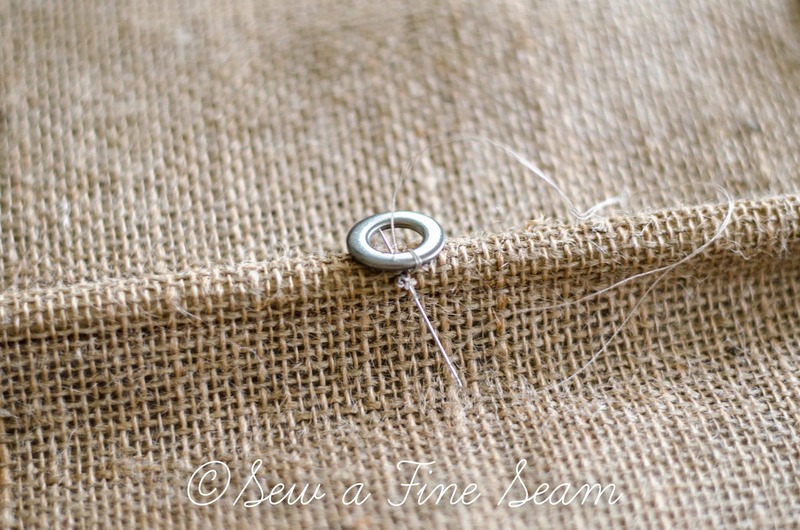 After the Burlap Roman Shade was created, I needed to attach some sort of rings to run the roping through instead of just running the roping through the fabric like I usually do. For a couple of reasons. 1. The roping wouldn’t run through the burlap as easily as cotton fabric. 2. I didn’t like the idea of white polyester roping because this Roman Shade was going to be on the door everyone enters to Allisa’s rental business. I wanted it to look good from the backside too. 3. Using the hemp rope I was planning to use made it impossible to run the roping through the fabric like I had on other Roman Shades. Using the white plastic rings sold at the fabric store specifically for Roman Shades wasn’t really the look I was going for either. So I headed to my local Home Improvement store. Heading into the hardware section a couple guys who worked there asked me if I needed help. I told them sort of what I was looking for – they really didn’t get it at all! I just know they love to see a woman walk in who is trying to create something industrial and ‘cute’ but really isn’t quite sure what to call what she needs to accomplish here goal. Some of my tools. The eye screws are for the roping to run through on the piece of wood at the top. The hemp rope is what I used for the Roman Shade’s pull ropes. 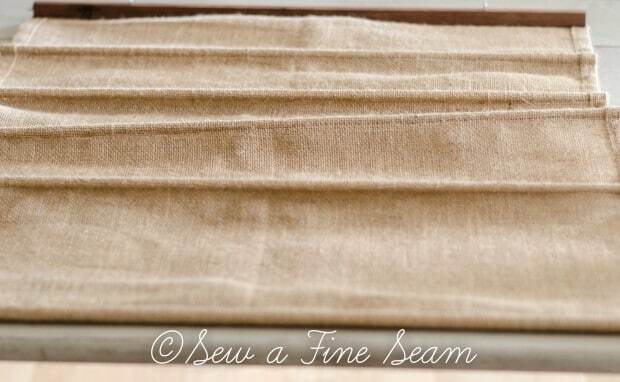 You can see all the how-to and step-by-step instructions in my Roman Shade Tutorial post. 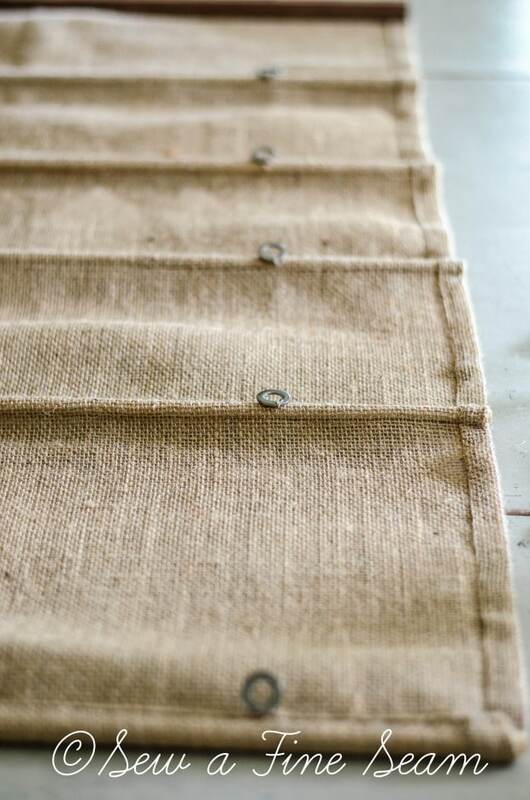 I quite like the look of burlap made into a Roman shade. I don’t love working with burlap so I won’t be doing many of these but once they are finished they sure are cute! 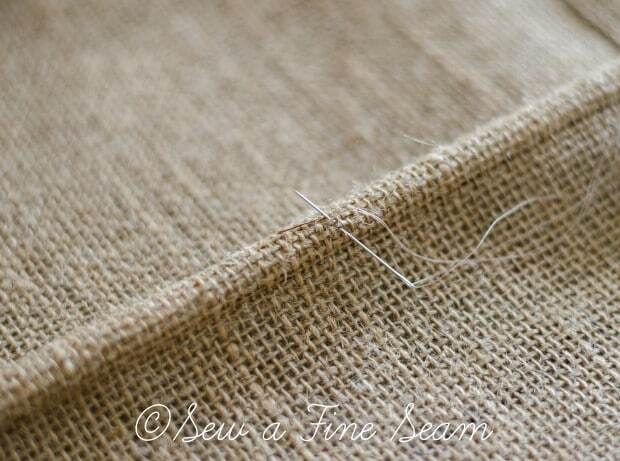 Burlap causes a bit of an allergic reaction in my skin and irritates my lungs. I’ll leave working with it to others most of the time! I figured how far in from the edge I wanted the roping to run and stitched a washer to each dowel pocket. The dowel rods were already in place. I only stitched one side of he washer on. The washer needs to be able to move freely in the stitching. Here you can see this washer is turned over – it swings back the other way too – I did not make the stitching super tight it wouldn’t break as the washer moved around. Washers all in a row. There is another row identical to this one on the other side. And here it is installed on the door it was made for! Doesn’t that roping look cool with the burlap?? 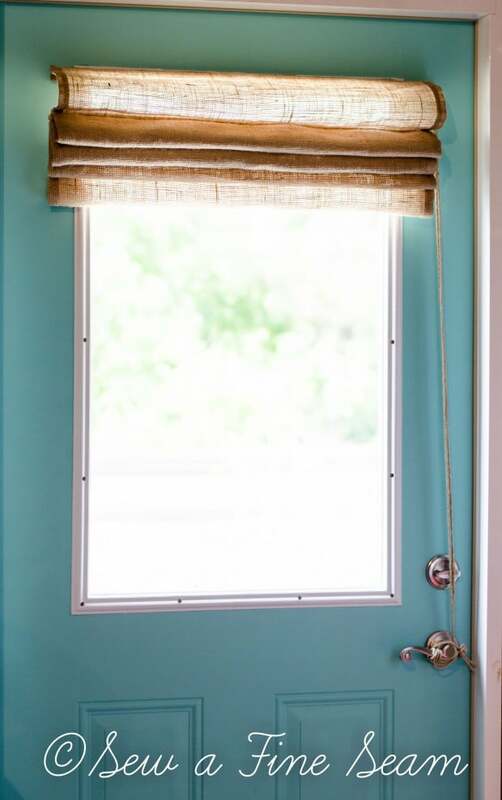 And the most impressive part – Allisa’s husband, Rob, installed the shade by using the screws that held the molding on around the door of the window. I think it’s so cool that we could add a Roman Shade to a steel door without adding screws or making new holes in the door. And from the outside. Doesn’t that look amazing?! If I do say so myself. I love the washers and the hemp rope with the burlap. So much better than white plastic rings and white polyester rope. 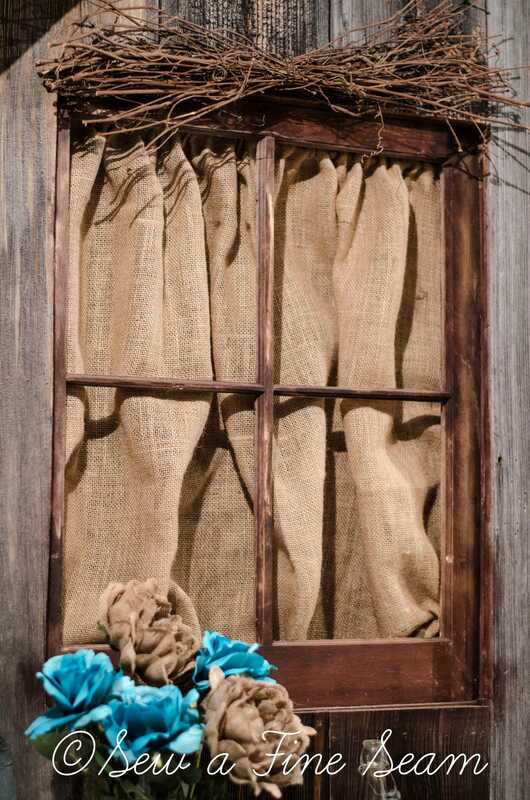 One of the curtain panels I made went on a tension rod behind this old window inside the shop. These panels were added for some texture and fun with the shutters. The curtains were easy and made a great impact in the shop. 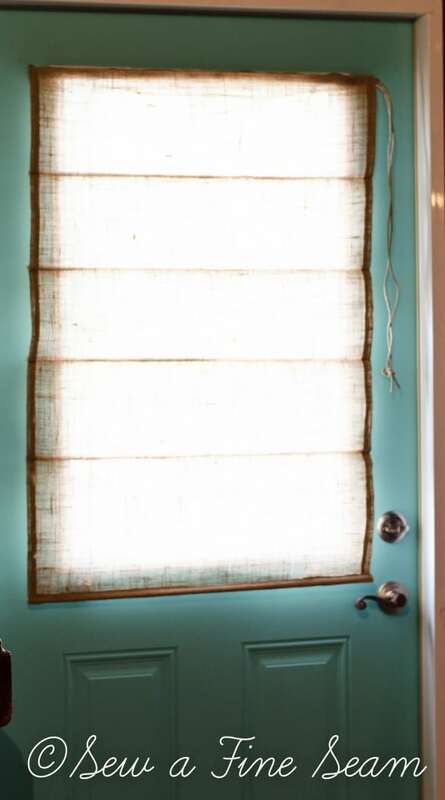 The Burlap Roman Shade was easy too, and such fun to create something a bit unique and something so perfect for this space. If you are in my area and need a rental for weddings, events, photo shoots, or whatever – Check out Thobe Rentals – she has some great stuff! Thanks Wendy! 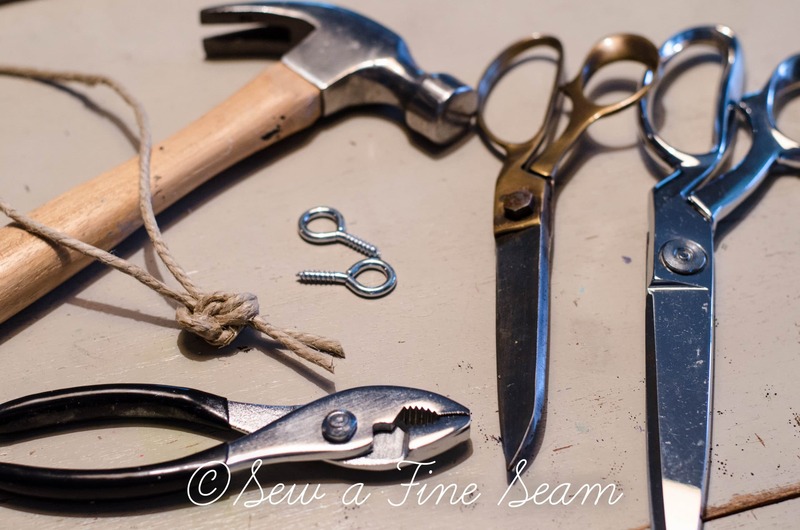 I haven’t totally forgotten your apron – just have not found time to get it made! I love the look! The washers are perfect! Thanks! 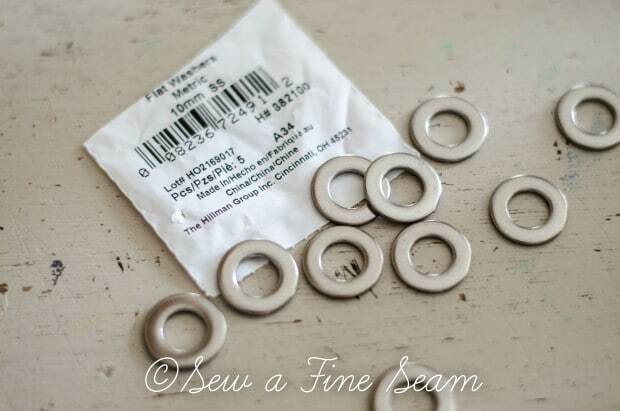 I love the washers as the rings! Gorgeous! Is that regular ol burlap? Not too shed-y? Hi Susan – yes that is regular burlap – straight from Joann Fabrics 😀 It sheds some but mostly while you are working with it. I do think if you washed it first, or even just soaked it in water and then hung it outside to dry first it would take some of the shedding out of it. You are so welcome! I love how that Roman Shade turned out and all the curtains look great in your shop! You are so talented! I love how that turned out. I’m a huge fan of burlap too. Jill these look amazing! I am definitely pinning and sharing. I need new roman shades for my back doors and I haven’t liked the look of anything I have seen. Thanks so much Karen! I love the industrial look of the washers and hemp rope. I don’t like seeing the plastic rings and polyester cord from the outside if the shades are down a lot. I need to make a roman shade for our back door, a steel door. I have a magnetized rod on it. Would be so nice to be able to raise and lower it depending on time of day. 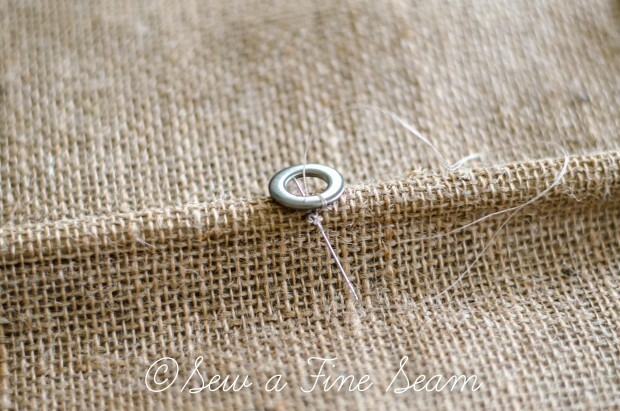 Your tutorial is wonderful and you were so right to use washers and jute string for the ropes. 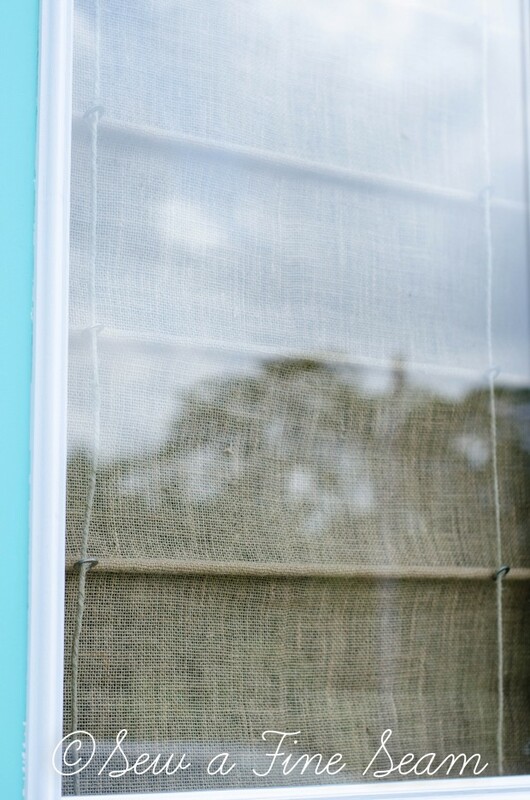 I won’t be making a burlap shade for back door but seriously considering for our bathroom window or sewing room window. Think I will line it tho as sewing room window faces west in hot afternoon sun. Lucky lady to have you make her window treatments. Need to go wash my arm pitties so we can go to thrift store and coop for more treats for chickens. I am loving having chickens except one of them (our favorite) is being pecked on the head. She has white/black feathers that look like a mop on her head. She’s quite a social chicken. Swear if I go outside for one minute it’s so hot I’m soaking right away. Hate to offend anybody. How come men can go to store all grubby, sweaty but a woman would be scorned for putrifying the place up? lol Just curious. Happy summer days dear friend. Yes, lining the roman shades when they need to keep out the hot sun is a great idea. 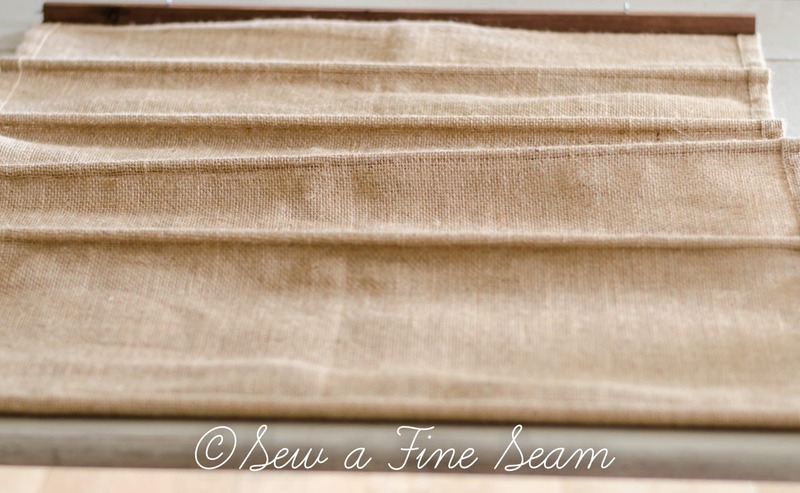 The linen roman shades I made for a friend a couple years ago were lined to protect the linen and create a better light block. Awww, thanks Brenda! I try to write instructions the way I would want to read them if I were making it for the first time! Thanks for the great complement! Perfect timing on this post! I need to make some Roman shades for m kitchen and one of them is for a new steel door that I am not allowed to put holes in!! Do you have any pictures of how it was attached to the door? I’m saving this post and the post of your tutorial so I can do this!!! Love the look of your curtains and shades!!! Hi Susan – sorry it took me so long to get back to you. There is a close up pic in the post of one side of the shade screwed into the door. The screws the farthest out on the top of the trim around the window were removed. I think longer screws were needed to go through the board and into the door. Drill holes through the board in the spots where the screw holes on the door line up and just screw through the board and into the holes in the trim! Let me know if you need more details – I can go back to the shop and get some more pics if you need them. My extra-large kitchen window needs a Roman shade!! 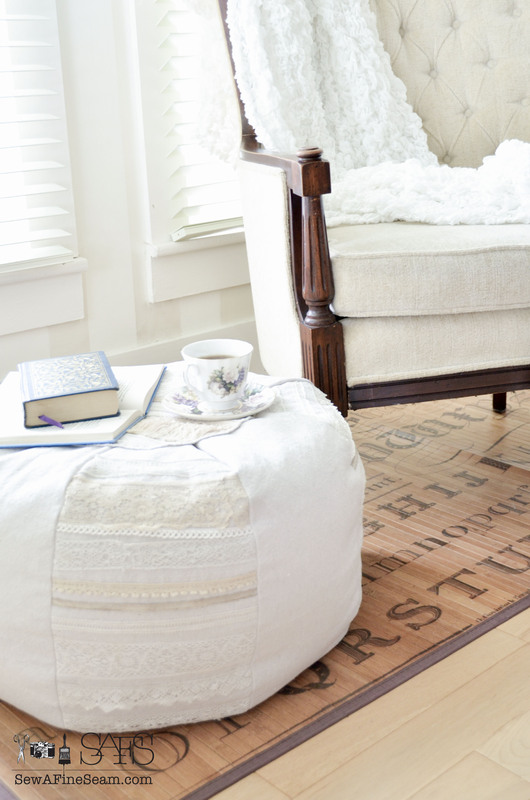 I just need to find the perfect material…..burlap could definitely work with my kitchen décor! 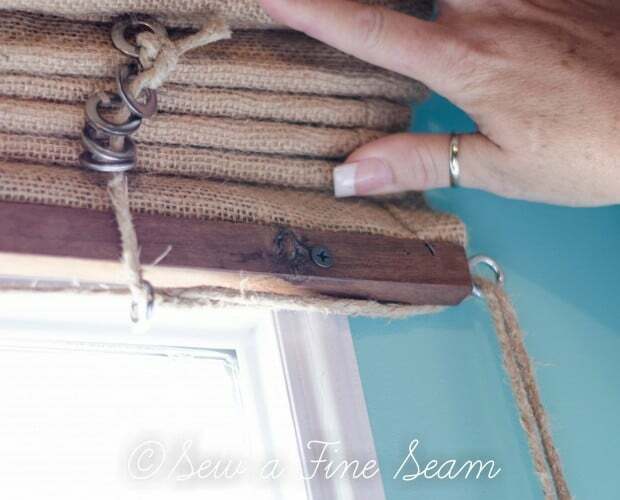 Love this idea of a burlap roman shade. I have never seen one like it. Turned out awesome!! Thanks Debbie! I was thrilled with the finished Roman Shade! Jill, I LOVE this! Just so much nicer looking than the plastic stuff. 🙂 Question: do you think the twine will fray sooner with use? Thanks Jami. This hemp rope is from Hobby Lobby I think, and is pretty thick. It might wear more than the polyester cording but I think it will be a long time before it wears enough to wear through. I like it enough that it would be worth it to me to have to change out the rope if and when it wears too much. Oh, I totally agree – definitely worth it, Jill! Just wondering the type of rope/twine you used, as I’ve gotten some really low-quality stuff lately. 🙂 I think the hemp may be better wearing than regular jute, so I’ll look for that – thanks! 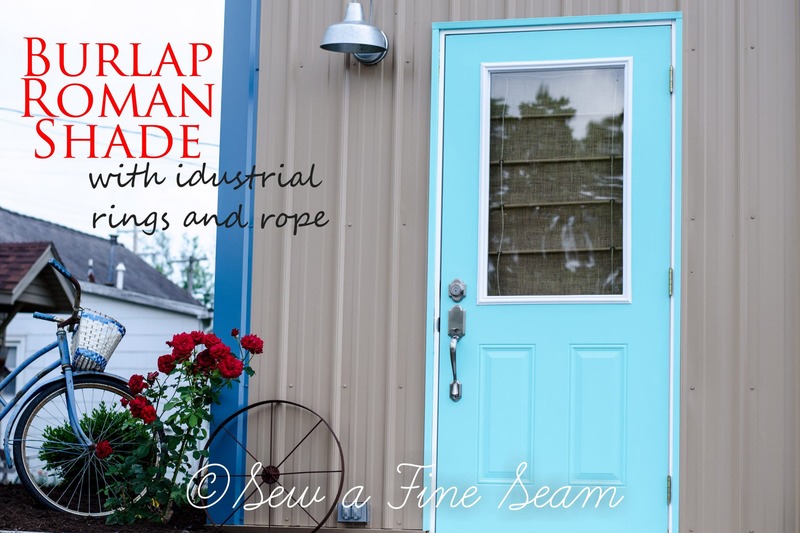 Hi Jami – the rope I used was from Hobby Lobby – I don’t have the packaging anymore 🙁 It’s not as thin as the polyester cording normally used for Roman shades but with the washers being a bit larger than the plastic rings it worked just fine. I did have to use larger eye screws so the rope would go through those easily. 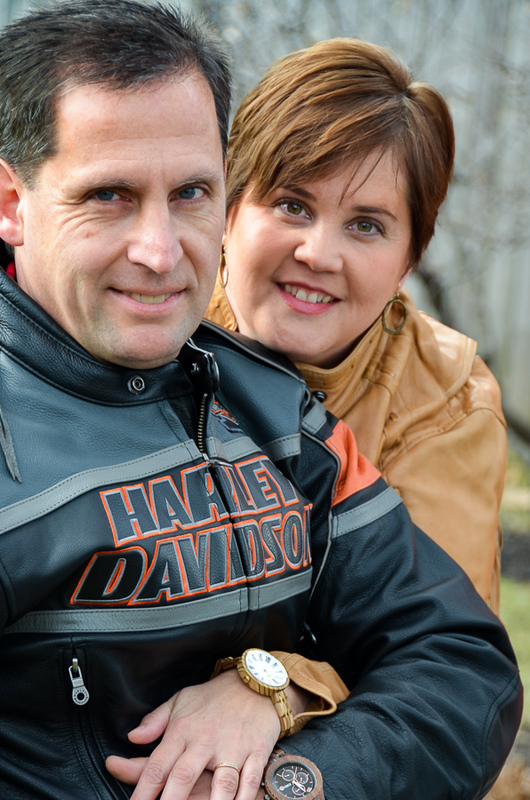 Thank you so much for linking this up Jill! Sharing later today when the party opens at 1:00 EST. Our youngest daughter just gave me this website, Pin it, today. gazebo, for me to sit outside and cross stitch,(31 yrs. this July). I sat outside last yr. for almost 4 months and loved it, and I told her today, that I wanted Roman Shades,to “block” some of the sun,while I am stitching. We found this part on Pin it. As the gazebo will be made out of pressured treated lumber and stained with a “clear” stain, I think these burlap shades will “fit the bill” for our gazebo. I will add pics. of the “finished” gazebo to my website, that she made me for my 61st. b/d. Now going “back” to Pin it, to “browse” some more to get “more” ideas. So happy to have found this tutorial. Looks a lot better than previous ideas I had found, and those didn’t look half bad! Your roman shade is gorgeous. Thanks for the idea! 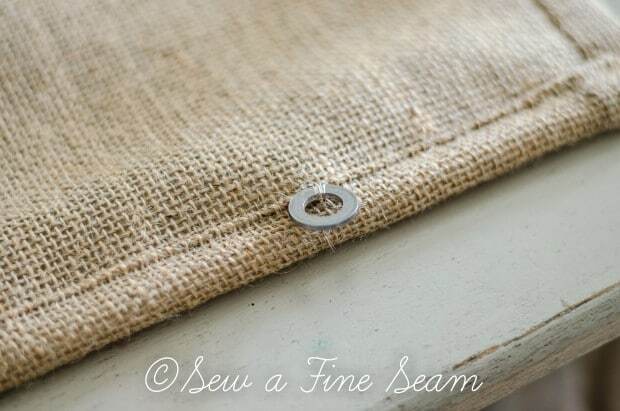 Thanks Nikki, I hope you are able to use my tutorial to make your own roman shade! If you have questions please feel free to contact me! How did you sew the sides? They look so clean yet burlap is so hard to keep clean like that. Did you use something on the material? I hemmed the sides by serging the edges, pressing the serging to the backside and then pressing a 1/2 inch hem down the side and stitching. I did this before I made the folds and seams for the dowel rods to go through. 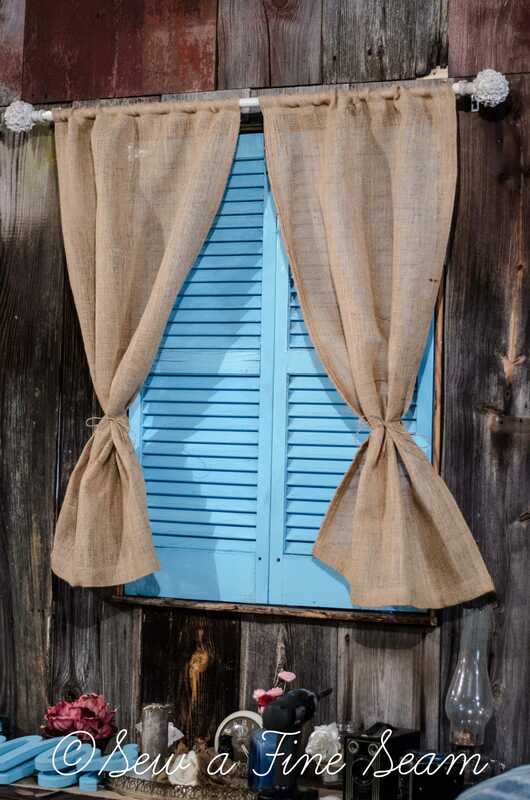 Awesome Job.Love the burlap curtains.Thank you for sharing how to make them.I have been looking for a DYI with good pictures and instructions .Your Blog is great.Keep up the awesome work…. Hi Jill, so happy to find your tutorial to make burlap roman shade. Think it does make difference seeing how you handled burlap, not easy fabric to work with by any stretch of imagination. Have made several table runners and couple pillow covers with burlap. The burlap you used looks as tho it’s better quality burlap, is it? Love fabric you used to make red striped roman shade, it’s gorgeous fabric,really. Am afraid to even check to see how much Annie Sloan fabric line is. Looks like would be very nice to work with. You did such beautiful job on both roman shades, going to make an attempt, have some bird/branches printed burlap from JoAnns would love to make bathroom curtains or really roman shade with it. You have inspired me to give it a shot. Hi JaneEllen! The burlap was bought by my client so I’m not even sure where it came from but it was a good quality burlap. I loved the way this turned out though I don’t love working with burlap!